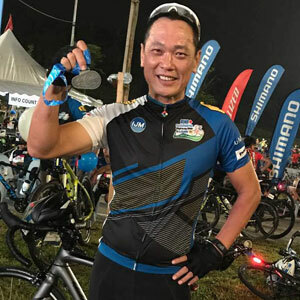 Our featured rider Richard Ng this time around is a former radio personality whom you are probably more familiar by the sound of his voice. The man was once the Breakfast Show host on MixFM for the past 11 years and currently he’s still heard frequently on radio and TV commercials as a voice over talent. 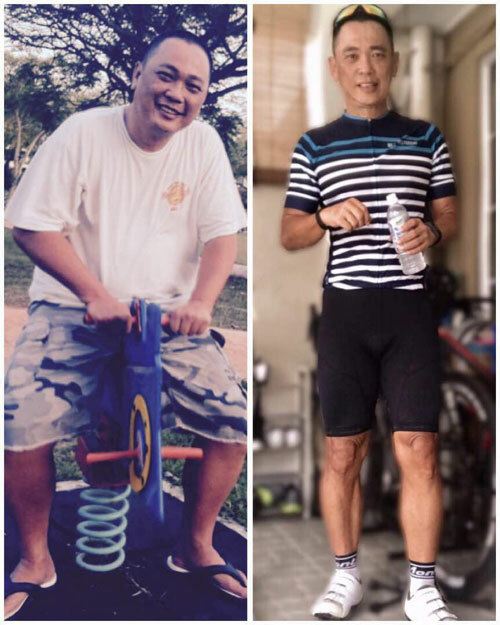 His cycling endeavor started exactly about a year back in September 2016 when he was diagnosed in February that year, for Type2 Diabetes (with a reading of 15, that’s three times higher than a normal person) prior to already being on medication for High Cholesterol. He weighed 105kg then and as you can guess was considered highly obese. His doctor told him if he didn’t do something, he could literally just drop dead of a heart attack! He’s tried losing weight in the past but in vain until Feb 2016, he said enough is enough and decided to make a lifestyle change. This is what he did to lose about 28kg in a year and a half since then. To begin with, he changed his diet plan by completely stopping white rice and sugar for about 3 months. Cut down on big dinner portions and just ate clean. Next thing he did was buy himself a pair of sneakers and started to brisk walk at the park as though he was late for the bus. He’d walk for an hour plus or so, until he was drenched in sweat. He’d do it twice a day. After 2-3 months, as his fitness grew he started incorporating slow jogs into his daily routine and as the months went by, he was jogging for about 10km each time. One day a friend told him he could burn a lot more calories if he did some cycling. On hearing this, he went out to USJ Cycles and bought something that would suit his budget. 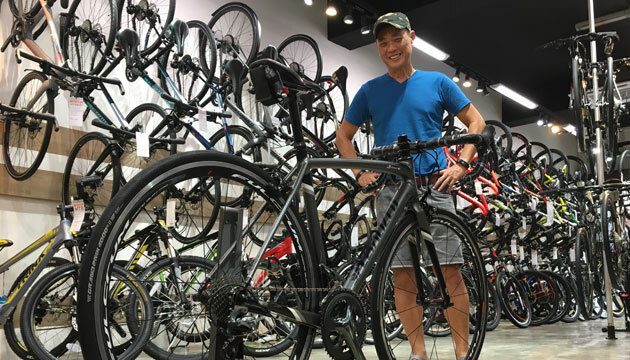 Being a fairly new rider he chose to get the Specialized Allez DSW Elite road bike because he wanted a bike that was well made, durable enough to take a few knocks here and there (being a novice cyclist) and one that wouldn’t cost him an arm and a leg. Since then, there was no looking back as he would diligently ride from his home in Subang USJ all the way to Sri Petaling and back. As he got stronger he added the mileage and always challenged himself for longer rides and a better average speed to improve. He’d ride to as far as Klang and back, especially during the weekends when there’s very little traffic early in the morning. He clocks an average of about 250-300km in a week now and averages a pace of about 31kmh. Exactly a year into this lifestyle change, the results showed up on his yearly medical blood test. His cholesterol level improved remarkably and was taken off medication after years of pill popping, his sugar levels dropped significantly and returned to a healthy reading and no meds were needed, his resting heart rate records an average of 46-48bpm and his blood pressure is 112/74mmHg. His waistline from a size 42″ is now shrunken to a size 34″ and he weighs between 75-77kgs. His path to recovery is so evident that it has inspired and motivated those who know him to follow suit what he did. Being motivated by this, he never fails to encourage and share his experience with anyone who’d like to know how he managed to lose the flab. Make the decision and tell yourself IT IS a lifestyle change you want and that’s why it’s called just that. Start with ‘baby steps’ because humans were never born to run, so start with walking if you’re an elderly person or considered obese. You’ll be doing your back and knees a big favor. Cut out carbs, especially white rice and sugar because sugar breaks down easily in your system and instantly gets stored as fat if they’re not used. Change to brown rice if you must but cut your portions down to a fistful only. If you can stop sugar, you’ll see significant changes in a short period of time. Cycling is good where it’s the only other sport (besides swimming) that doesn’t put strain or impact to your back, knees or joints. Burns off fat much faster compared to many other form of exercises. If you don’t believe me, try it! Lol. No excuses! Sneak in an hour or so to cycle everyday or alternate days because other than the workout, it’s also something called ‘me time’. Leave everything behind and just exercise. That workout session will guarantee to do your heart and soul a lot of good. Make it a habit and like they say, it only takes 22 times to become a habit. Constantly keep reminding yourself to never look back in the past but instead, look towards the future and tell yourself that’s where and what YOU want to achieve. Trust me, your past will try to pull you back but put your foot down and just move forward. Again constantly remind yourself, No Excuses. KISS- Keep It Simple, Stupid. Lol. Don’t do anything beyond what you can realistically achieve and keep things simple for a start and you will still get the same results. Basically, you’ll be better off doing brisk walking rather than jogging if you don’t have the stamina and you’ll still achieve the same results. A lot of people fail because they put too much on their plate, chewing more than what they can swallow. Celebrate life and welcome the new you. Embrace the lifestyle change with open arms. Remember, life doesn’t have to be complicated. Go to a trustworthy and reliable bike shop, get to know the shop and have them help you to find the right type of bike for you. 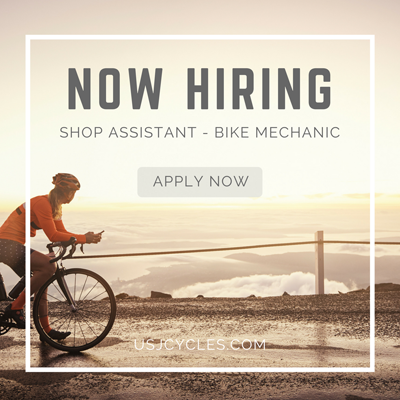 Build a relationship with local bike store and they will be ever willing and happy to share with you valuable and sound advice on your cycling journey. They’ll be looking after you and your bike like family. Be weary of online shopping, you don’t want to put yourself at risk of injury with replicas and fake bike parts. Warranty and product support from brand principle (supplier) is a key of after sales service. Note: Richard Ng is not by any means a professional or a doctor. This is purely based on personal experience and logic. Listen to your own body and do what works best for you. Occupation : Voice Talent, The Voice Guild Of Kuala Lumpur and Selangor. Hobbies: Scuba Diving, Cycling, Running and most outdoor activities. Current Bike : Specialized Allez DSW Elite, Size 54. 10 Great Christmas Gift Ideas for your Favourite Roadie!